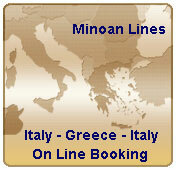 Minoan Lines prices Trieste Igoumenitsa Patras ferries and Trieste Ancona Trieste. TRIESTE - ANCONA - IGOUMENITSA - PATRAS or v.v. HighSpeedFerries "CRUISE EUROPA" - "CRUISE OLYMPIA" - "EUROPA LINK"
• 20% discount for students/passengers up to 26 years old with or without vehicle (not valid for Deluxe cabins). • Children up to 4 years old travel free of charge without entitled a seat. • 10% senior citizen discount to all passengers over 60 years old with or without vehicle. (The offer is not valid for Camping on Board service). THE RETURN COLUMNS INCLUDE THE 30% DISCOUNT. Be the first to enjoy a new service tailored especially for the passenger who travels in comfort, luxury and economy with his camper/caravan. ... ALL at the same price of a DECK & camper / caravan reservation ! 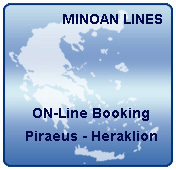 If you wish to take your pet in the cabin, you can enjoy a special, reduced fare of only 25 Euro, per pet/stretch! “All Inclusive Camping” service is valid all year round.